IVONDING is a patented method using the hot embossing process. 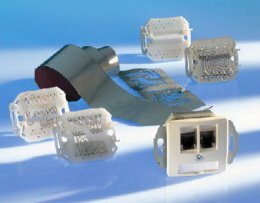 IVONDING is one of the methods for manufacturing MID (Molded Interconnect Device),and forms circuit patterns on the substrate of thermoplastics without plating. We are making the development and sales activities in cooperation with Osaka Vacuum Chemical Co.,Ltd , who is the sole agent of IVOTAPE in Japan and Asia. As conductive circuit patterns can be rapidly and precisely embossed on a plastic substrate, wire or printed circuit board are no longer necessary. *IVOTAPE is the copper sheet made by electrolysis, and has the favorable shear strength to embossing and the good electrical conductivity. Electrical conductivity corresponds to the values of standard copper sheet of PC Board. The copper sheet is manufactured in thickness of 18, 35, 70 and 100 micrometers. A electroplating layer of tin/lead, nickel, silver or gold can be applied to the copper surface. As the projection like cauliflower on the back side of the copper sheet eats in the heated resin like anchor, the reduction of bonding force does not happen by heat and time . Molded parts can be equipped with various functions such as boss ,rib and clump. Conductive circuit patterns can be formed on not only flat plates but also taped and side sections. Available for the conductive current from signal to power sources such as 14 amps of current. Wide selection of thermoplastic grades and no need of electroless platable grade. Low cycle time and low investment cost resulting in competitive manufacturing cost. No waste water exhaust which occurs in chemical etching process. The data shown in this home page are based on our accumulated experience and laboratory data, and not always directly applicable to your products used under different conditions. Therefore, we can not guarantee that the contents of this home page are directly applicable as they are to the specific condition in our customers, and we appreciate your final decision on the use of these data. Copyright(C) 2003 Mutsuki Electric Co., Ltd. All Rights Reserved.